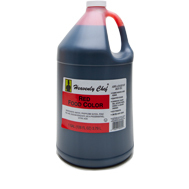 From red velvet cake and lemon tarts to Chinese char siu, our food coloring has long added a dash of color and fun to pastry goods and prepared food items. Ideal for Chinese lemon chicken, sweet & sour dishes and egg tarts. It also adds that burst of yellow to all Easter egg decorations, cake mixes and icing needs. Great for Chinese char siu and other barbequed meats. It also adds that touch of rouge to all Easter egg decorations, icy treats, cake mixes and icing needs.